Much ado has been made about the confusing nature of wood-warblers on their way south in the fall. They no longer have the distinctive colors and markings of breeding plumage and juveniles with their even more obscure plumages are thrown into the mix. Usually, however, with a decent enough look at a wood-warbler it is rather easy to figure out exactly what species the bird is. The problem is getting that decent view. Whether big leaves or back lighting are obscuring the little bird you are trying to identify or the hyperactivity of the bird itself prevents you from obtaining that ideal look sometimes you just have to let the bird get away and write it in the notebook as unidentified. But what happens when you get sustained looks at a bird, and even pictures, clear ones at that, and you still walk away not entirely sure what bird it was that you just spent ten minutes staring at? That just happened to me today at Jamiaca Bay. At first I thought I had a Tennessee Warbler but the wing bars and lack of a strong light supercilium eliminated that species. Then I was thinking Blackpoll Warbler or Bay-breasted Warbler but I quickly eliminated Bay-breasted as the color wasn’t right and the undertail was a nice crisp white. Now I’m thinking it was maybe a Pine Warbler, but I still think that Blackpoll Warbler is the most likely identification as Pine Warblers have cheeks “sharply set off from throat and bordered behind by pale upward extension from rear of throat.” At least, according to A Field Guide to Warblers of North America in the Peterson Field Guides series. But then again, the tail seems a bit long for a Blackpoll Warbler. 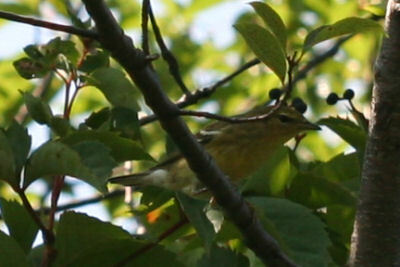 And, on the other hand, it never pumped its tail like I would expect a Pine Warbler to. Aaaarrrgghhh! Anyway, if you are already sick of football’s opening Sunday (American football to our real football-loving visitors), take a gander at the pictures I shot of this obscurely-marked warbler and let me know what you think. Did I make the right call? Am I an idiot? Or some combination of the two? I was just at our county’s bird banding station and even the expert banders were having trouble with identification! My first thought was that it was a Blackpoll Warbler. They can be so similar though, especially when I start thinking about it. I don’t know if you are right, but I am positive you aren’t an idiot! Take what you read in field guides with a grain of salt, each one tells a different story and has different illustrations. Seems like I’ve been telling a lot of people (including myself) the same thing, call it what your gut tells you to call it, not what field guides say a bird should be. Looking at the pictures a second time, I’m leaning more towards Blackpoll, but since I didn’t see the bird in person, I can’t tell for sure. What a toughie! My first impression was Pine actually, the beak looks awfully thick for a Blackpoll, but I can certainly see where you’re coming from. How was it moving around? 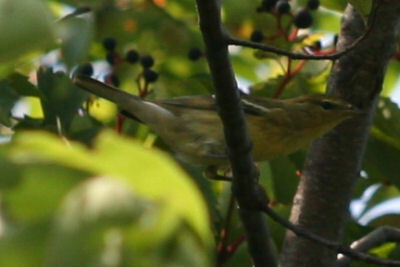 Pine always seems sluggish, almost vireo-like to me as opposed to the other high energy warblers. @Nathan: You know, I had mentioned to Will that the bird was giving off a “Vireo-like giss.” Double argh! 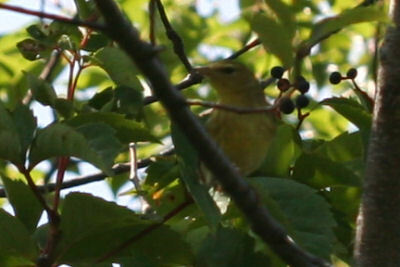 One thing is for sure, it is not a Tennessee Warbler. or an Ivory-billed Woodpecker for that matter. The Pine/Blackpoll/Bay-breasted fall complex may be one of the toughiest ID’s outside of Gulls and Shorebirds.